Cuil. Just writing that ill-begotten search engine’s name again makes me shudder. But hopefully, this may be the last we’ll hear of the site for some time. Cuil.com went down tonight, and according to former employees, it’s down for good, TechCrunch reports. Current Cuil employees apparently weren’t paid this week, and they’re seeking other work, the ex-employees said. There aren’t any other details to go with at this time, but the situation certainly doesn’t look good for the company. Frankly, I’m surprised it held out so long. Cuil launched in July 2008 with tons of fanfare, including a surprising amount of mainstream coverage (I remember first hearing about it from NPR the minute I woke up). But for a search company that was famously founded by ex-Googlers, and aimed to compete directly with Google, it was a laughably bad search engine. The site’s claim to fame was its huge search index — at launch it contained 120 billion web pages, making it three times bigger than Google, co-founder Anna Patterson said. It also featured a ranking system that wasn’t based on web page popularity (determined primarily by links with Google’s PageRank algorithm) and instead focused on content relevancy to searches. But when it came to actual searching, users found Cuil’s results generally inaccurate, and at times simply baffling. For example, performing a search for “wiki burgess meredith” on both Google and Cuil yielded a striking contrast, according to Cracked.com. Google correctly located the actor, who was famous for playing Rocky Balboa’s trainer Mickey in the “Rocky” films, on Wikipedia. Cuil, instead, found a hilariously translated description from a Chinese wiki page on “Rocky V”. As the screenshot to the left shows, Cuil even had trouble finding itself. The search engine became such a joke that it eventually spawned a meme dubbed “Cuil Theory” on the social news site Reddit. It was “a new hypothetical unit of measurement representing one layer of abstraction from true reality,” according to Know Your Meme. It was eventually revealed that Cuil’s investors valued the company at an insanely high $200 million post-money before its launch. 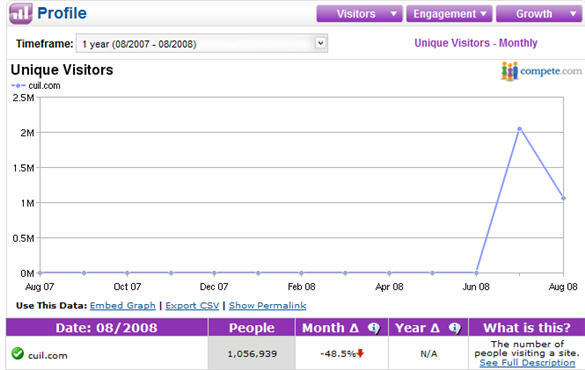 As VentureBeat’s Matt Marshall put it at the time, “What were they thinking?” Traffic to the site quickly fell after the search engine’s July ’08 launch, according to data from the traffic analysis firm Compete. Looking at Cuil’s past year of traffic on Compete, it appears that the site remained steadily under 200,000 visitors — trailing behind aged search engine AltaVista’s 1 million to 800,000 visitors. Again, it’s still unclear if Cuil is actually gone, but even vague news of its demise is worth a reminder of everything it did wrong. And while the site may be dead, you can be rest assured that terrible Cuil puns will live on in internet infamy.